Quantum Leaps Retreats is an unique, peaceful, scenic, and spiritual Retreat right on the Blaeberry River in the Blaeberry Valley just 15 minutes northwest (17km) of Golden, BC. Brian and Annette who live on site with their 2 cats Aspen and Maple and 27 chickens, share with you their 11 acres of land. Over the last 30 years, they have built and created their dream of a healing spiritual Retreat Centre. We welcome people on our land who are seeking a place of authentic Retreat; for peace, reflection, quiet, and rejuvenation. And are also seeking a beautiful way to be together to connect with Nature and with each other. We encourage people to leave their technology behind, come and re-calibrate your energy away from EMF’s and re-tune back to Mother Earth. We hold the opportunity for you to experience SOUL Tourism! 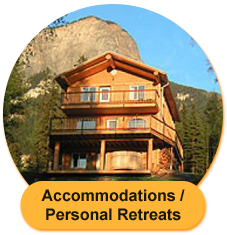 We call our accommodations; personal retreats. 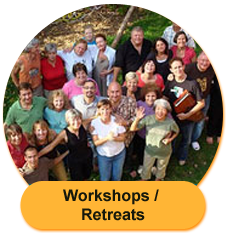 Our Retreat is an ideal gathering place for looking for a quiet, spiritual, and unique way to be together. Available accommodations include our Main Lodge, South Point Cottage, North Point Cottage, Cliff House, River Room, Meditation House, or our 26′ diameter Teepee. 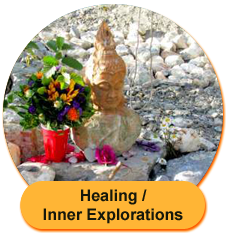 We offer many healing options, such as massage, labyrinth walks, the transformational labyrinth, and much more. In our efforts to be sustainable, we have a large vegetable garden, Greenhouse, compost pile, chickens, solar panels, and back up generators that run on used veggie oil! 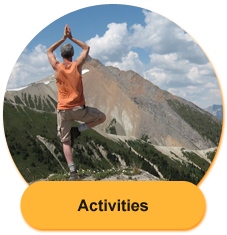 Scheduled retreats and workshops are also available during the year. See our 2019 retreat schedule. We hope you can join us! If you wish to tour our property; to inquire for a future stay or Retreat, then please call us ahead of time at 250-344-2114 to book an appointment.